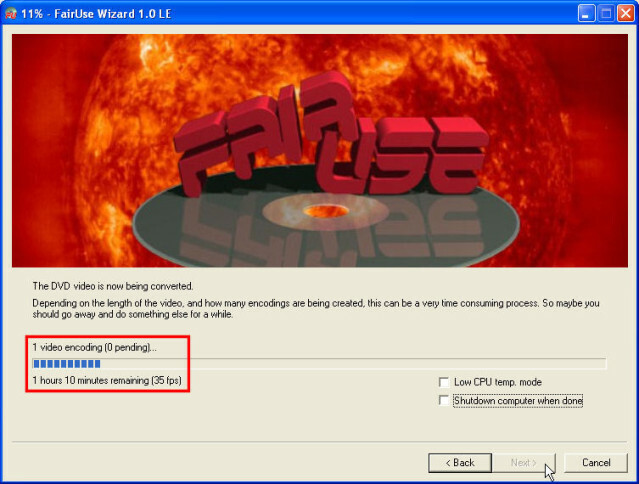 April 18, 2008 10:50 pm: FairUse Wizard 2.8 was released. While most of the screens and options remain the same, there have been a few minor changes. In addition, The Core Pocket Media Player (TCPMP) is no longer available. It has been upgraded dramatically and given a new name, CorePlayer Mobile for Palm OS. 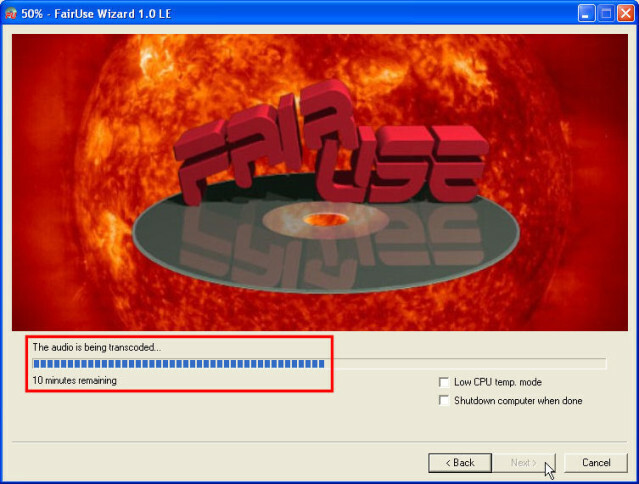 September 8, 2005 1:00 am: FairUse Wizard 2.1a was released. While most of the screens and options remain the same, there have been a few minor changes. A few of the screenshots have been updated accordingly. You will need approximately 6 to 8 GB of free hard drive space on your computer. This varies on the DVD and the conversion settings. You will need approximately 242 MB of free space on a SD or CF card to convert a 2 hour movie. A blank 256 MB card will work. You can make due with less if you are willing to live with a lower quality video. I find 242 MB works well for Palm OS5 devices and Windows Mobile devices, and this gives me the ability to put multiple movies on higher capacity memory cards (i.e. 2 movies on a 512 MB card and 4 movies on a 1 GB card). Anything higher than 242 MB needs to be reserved for Windows Mobile devices. Most Palm OS5 devices cannot handle anything larger. I will discuss the actual settings for each device further in this tutorial. You will need approximately four hours to complete the process. The time I quote is based on my computer (2.0 GHz Pentium IV with 512 MB of RAM running Windows XP, Professional Edition). Depending on your machine, it could take less time or more time. Fortunately, most of the steps can run without you being there or can run in the background. On the welcome screen, just click Next. You can modify all the same parameters later. When you are asked create a project, it does not matter the name or the folder of the project just as long as they are both there and valid. Click Next after filling in the appropriate information. Next, it will ask you to select a DVD drive. 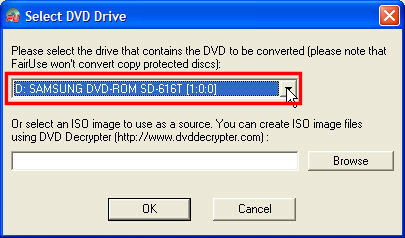 This is where you will select the DVD drive you are using. After you select the correct DVD drive, click on OK.
Next, it will list the available "chains" on the DVD that you can select from to create a movie. Obviously, the "chain" with the longest duration will be the one you want to select. Select and click Next. Now, FairUse creates an index that can take a while to process depending on the length of your movie. 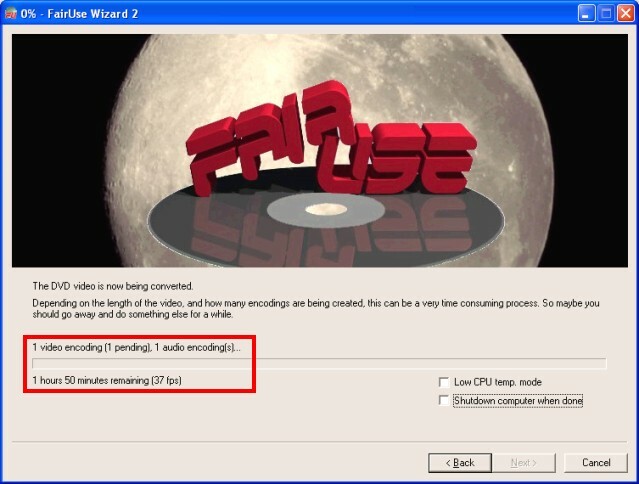 On my computer, the process takes approximately 15 minutes or less. This index helps synchronize video and audio. After the index is created, a screen will be displayed where you can crop the video. Then, I adjust Left, Right, Top, and Bottom adjustments manually. Once you get everything like you want, click Next. 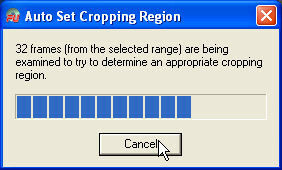 Then, it will ask for a field combination. Most of the time it needs to be IVTC mode, but you can just click on Auto Detect. Finally, the final screen is displayed before the DVD is converted. This is where you can make all your adjustments. For now, we will just worry about two settings, the audio bit rate and the file size. 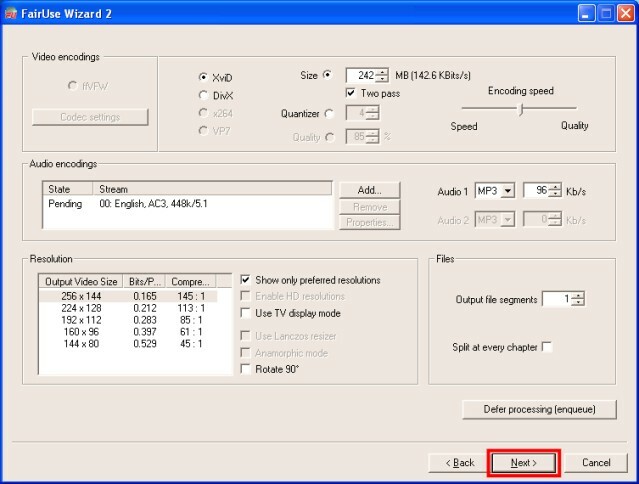 We will also want to pay attention to the video bit rate when changing these two settings. For a good conversion of a 2 hour movie that will fit on a blank 256 MB memory card, change the file size to 242 MB and change the audio bit rate to 96 Kb/s. There are a bunch of options available, but you just need to worry about the audio bit rate and the file size for the first run. 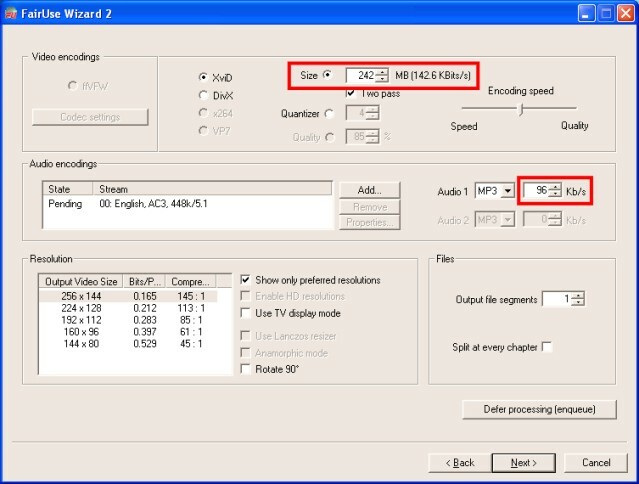 In addition, you want to pay attention to the video bit rate at the top of the screen when you change the audio bit rate and/or the file size. This is important because the video bit rate you are able to handle is highly dependent on your device. In addition, the video bit rate will vary on the length of the video you are converting. Let's say you are converting a 30 minute movie instead of a 2 hour movie. In this case, 242 MB would be excessive. In fact, it may not even run properly on your handheld. Most Palm OS5 devices can only handle a video bit rate around 200 kbps. Since the new player for Palm OS5 devices (CorePlayer) was released, you should be able to bump up the video bit rate. I have yet to determine any exact numbers, but I hope to post them very soon. Most Windows Mobile devices can handle a higher video bit rate in the neighborhood of 400 to 600 kbps. There are exceptions. For example, the Dell Axim X50v has a 624 MHz processor with a graphics accelerator that can handle a video bit rate around 1500 kbps. All I can say about this is, "Wow!!" UPDATE: Well, I gathered some data together from these links (Palm Benchmarks and Windows Mobile Benchmarks), and I put only the necessary information in the table below. It shows the maximum quality that each device can handle based on the benchmarks from the two links mentioned earlier in this paragraph and based on the video samples provided. The video samples can be found here (link no longer works). The settings are not exact maximums, but are good guidelines to follow. 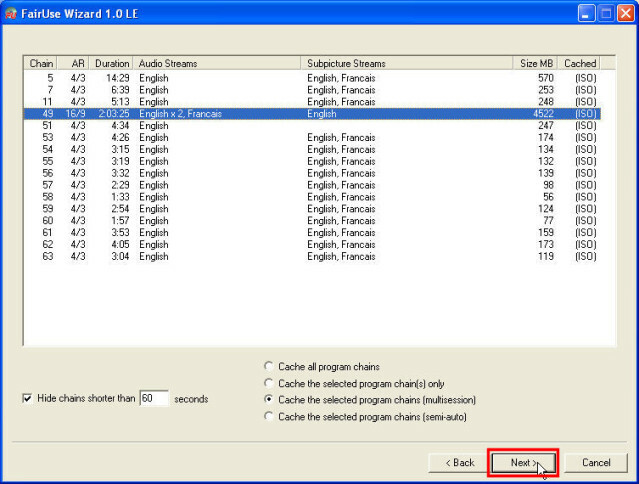 For using these settings in FairUse, I recommend setting the audio bit rate. Next, I would adjust the file size until you get on or below the maximum video bit rate at the top of the screen. 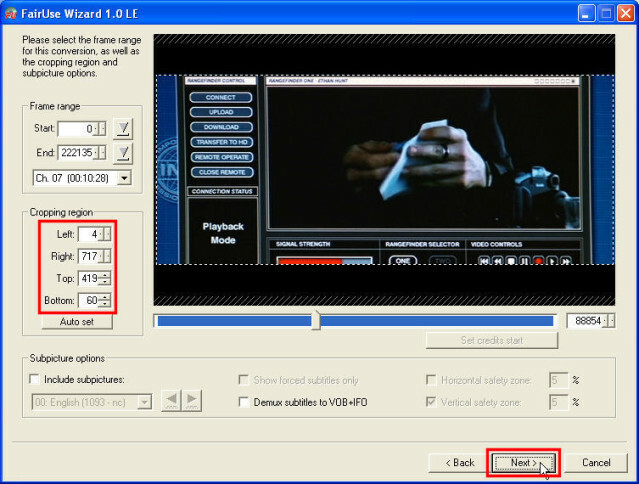 Then, I would select the corresponding video resolution as suggested in the table. * May have to use lower video settings for the Sony UX50, Resolution: 216x160, Video Bit Rate: 192 Kb/s, Audio Bit Rate: 56 Kb/s. Well, you are almost there. Now, you just need to kick off the conversion process by clicking on Next. Now, go off and do something else like sleep. This process takes approximately two to three hours on my computer for a two hour movie. During this process, it will make three passes: a video, an audio, and then another video. Then, it will combine the video and audio to an AVI file. After it completes, you will have an AVI file ready to transfer to your Windows Mobile. As with DVD Decrypter, the FairUse Wizard LE runs pretty good in the background. I am able to do other low intensity tasks like surf the Internet or check e-mail. Your experience may vary, so you might decide to do something else while your computer processes the conversion. Plus, it will take longer if the computer has to multi-task. 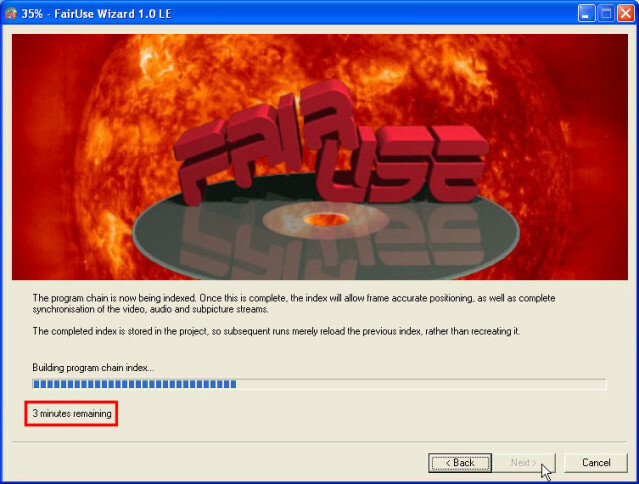 After being away or doing something else for a while, the FairUse Wizard LE should have succesfully converted the DVD to an AVI file in the folder you specified for the project. Here is the list of files created. You are interested in the AVI file listed. If you noticed, the AVI is 494,352 KB. Since I have a blank 512 MB SD card I use for movies, I use a larger file size for better quality. In addition, I am using a Windows Mobile that can handle the higher bit rate. Now, just copy the AVI file to your external memory card. I recommend using a card reader, but there are other options. For a Windows Mobile device, you can do this via ActiveSync. For a Palm OS5 device, you can do this via HotSync or a third-party software package called Card Export II ($14.95 USD). For Sony Clie Palm OS5 devices, you can use MS Import. Note: A card reader is the fastest option. 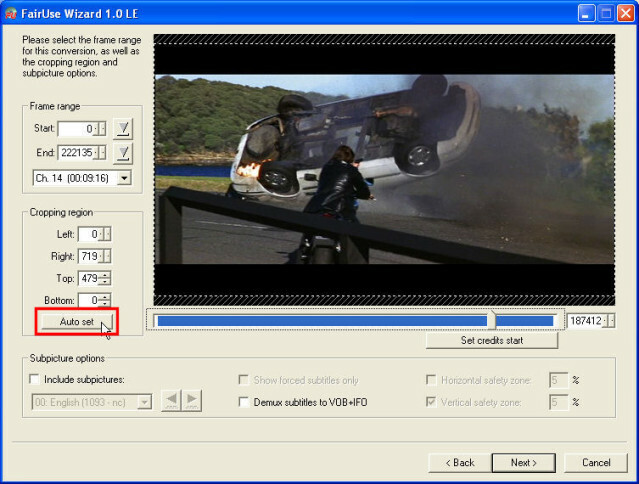 By the way, you can view the movie on your computer to check the conversion before taking the time to copy it to your handheld. To do this, you might need to install the XviD codec. You can download it here. If you want, you can actually use the DivX codec with the FairUse Wizard LE, but you will have to install the codec before using FairUse. You can download the DivX codec here. Play movie on a Windows Mobile or on a Palm OS5 device using CorePlayer. Now, it is just a matter of queuing up the movie on the handheld. I think you will be pleased with the results!